The silhouettes currently on display at Elgin Museum, volunteer Gayle Henderson is pictured. Picture by Jason Hedges. Elgin Museum has been given the six figures to form part of their moving galleries, showcasing the effect both world wars have had on the area. The emotive “there but not there” sculptures have been spread throughout the attraction to act as a reminder for visitors about the fallen. A colourful cavalcade of more than 200 handmade poppies have already been put up at the museum as part of its commemorations to mark a century since the end of World War I. 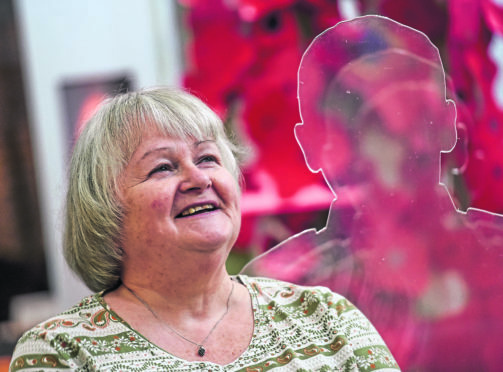 Museum volunteer Mary Shand believes the soldier silhouettes will prove though-provoking for visitors. She said: “We want to position them throughout the galleries so that people just come across them while they make their way round. The figures have been donated to Elgin Museum by the Armed Forces Covenant Fund Trust and will continue to be used in future years. The attraction is closing for the season at the beginning of next month but is opening especially on Remembrance Sunday to be part of the commemorations, which will include a new exhibition of memorials and war artefacts from the local area. Lord Lieutenant of Moray, Lt Col Grenville Johnston, hopes the silhouettes will provide a poignant addition to the museum’s war galleries. He said: “I was very pleased to learn that the museum had decided to create a display in memory or World War I.